When your back is up against the wall, your bank account is empty, and creativity and passion are the only resources you can afford, success is your only option. 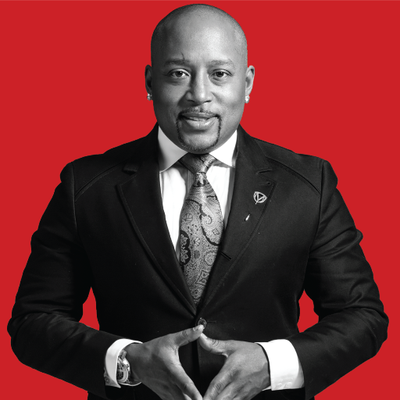 Join us for an exclusive live chat with FUBU Founder and Shark Tank investor Daymond John on Wednesday, January 20 at 2:30pm EST and learn how to tap into that Power of Broke to scrape, hustle, and dream your way to the top. This is an interactive live stream, and we encourage you to tweet any questions before and during the live stream using the hashtag #GALive. Get extra credit by ordering Daymond's new book, The Power of Broke. Available through all major retailers on January 19, 2016. Yes! Please keep me posted on news, events, and happenings from GA and participating partners. Daymond John has been practicing the power of broke ever since he started selling his home-sewn t-shirts on the streets of Queens. With no funding and a $40 budget, Daymond had to come up with out-of-the box ways to promote his products. Luckily, desperation breeds innovation, and so he hatched an idea for a creative campaign that eventually launched the FUBU brand into a $6 billion dollar global phenomenon. But it might not have happened if he hadn’t started out broke - with nothing but a heart full of hope and a ferocious drive to succeed by any means possible. Tune in on January 20 for an exclusive live chat with Daymond John and learn how we can all leverage the power of broke to phenomenal success. This is an interactive #GALive event. Tweet any questions before and during the live stream by using the hashtag #GALive. Upon registering you will receive an email with the link to the live stream event an hour prior to the event. Unable to attend? You can still RSVP to receive a video recording via email following the event. An entrepreneur in every sense of the word, Daymond John has come a long way from his $40 budget by growing FUBU into a six billion dollar brand. The Founder of FUBU, Presidential Ambassador of Global Entrepreneurship and Co-star of ABC's Shark Tank, is a celebrated pioneer in the fashion industry, best-selling author, branding guru and highly sought after motivational speaker. Michael Parrish DuDell is an entrepreneur, keynote speaker, and the bestselling author of Shark Tank Jump Start Your Business, the official book from ABC's hit show Shark Tank. Ranked as one of the top three most popular business authors by Amazon.com, Michael is a recognized industry expert and television pundit who is regularly featured across numerous media outlets, including CNBC, Fox News, CNN, Fox Business, Bloomberg TV, NBC News, Nightly Business Report, The New York Times, Fast Company, Inc. Magazine, Business Insider and many more. For nearly 40 years, Entrepreneur Media Inc. has been serving the entrepreneurial community providing comprehensive coverage of business and personal success through high-quality, original content and events. Entrepreneur magazine, Entrepreneur.com, and publishing imprint Entrepreneur Press provide solutions, information, inspiration and education to millions of entrepreneurs and small business owners worldwide. General Assembly is an educational institution that transforms thinkers into creators through education in technology, business, and design. Our global network of students, instructors, and entrepreneurs aims to bring people together to take advantage of a new kind of learning-by-doing approach to education. You will receive an email with the link to the live stream event an hour prior to the event.